Hey guys this is Andre Da Silver for CopsPlus. We're here to talk about breaking-in your new holster. We get questions from customers regarding their holster being too tight for their gun, but actually your holster just needs to be broken in. Today we'll show you just how to do that. Here we have a pair of brand new leather holsters for a GLOCK 17. I'm going to take my weapon, check the chamber, make sure the gun is safe to handle, and now I'm going to holster the weapon for the first time and see what happens. All right, immediately I notice a lot of resistance. This is a problem for a couple of reasons. 1: You don't want to fight your gun into the holster, and 2: This is going to cause unnecessary wear on the finish of your gun. Now drawing the weapon, again, a lot of resistance here. I shouldn't have to fight my gun out of the holster. This is a concern especially in the moment of combat when you need to draw your weapon efficiently. We're going to show you a couple of techniques to make drawing and holstering your weapon much easier. 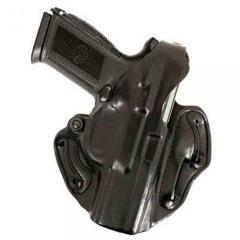 The manufacturer of your holster uses a technique known as the wet molding process. This is where they take a mold of your gun and they insert it into a wet holster. They use pressure to capture the exact contour and shape of your gun. By the time it dries, it's natural for the leather to shrink a little bit, and when you receive your holster, the fitment might be a little too tight. Before we begin the break-in procedure, you want to check your holster for a tension screw. If you have one, just make sure you loosen it up. The first step in breaking-in your holster is wrapping your gun in something to protective finish and allowing it to slide in the holster freely. What we usually use is a plastic bag, but you can use a dress sock, waxed paper, or plastic wrap. You're going to take your plastic sandwich bag, you're going to insert the gun with the handle exposed so that you can have a firm grip before you go and holster your weapon. As you're holstering your weapon you want to give it a few twists to expand the leather. This will allow the gun to fully sit inside the holster like so. You leave this overnight, the following day when you draw your weapon, get rid of the bag, you holster the weapon, you should notice it glides in a lot freer. If not, just repeat the process 1 more time. If your holster has a retention strap and you find it difficult to close it while the weapon is holstered, what you want to do is hold on to the strap and pull on it while pushing the weapon into the holster. This will stretch the strap and will sit the weapon fully into the holster. Give it a few twists, and as you pull it around, you should find it a little bit easier to snap it shut. Leave it overnight and this will break-in your retention strap. Keep in mind that your holster will continue to break-in as you wear it just a normal wear. You can also, to speed up the process, use a lubricant such as Draw-EZ. Just make sure you don't use any dressings, conditioners, or Mink Oil because those will soften the leather too much and can compromise the retention of your holster. I'm Andre Da Silva for CopsPlus. Make sure you subscribe to our channel cause we have more great videos coming your way.